Heavy-duty carbon steel construction with full shrouding package and column cover. 3” diameter dust take-off with butterfly valve vents displaced air to existing dust collection system. Fully adjustable high output electric densification system settles products for maximum bag stability. 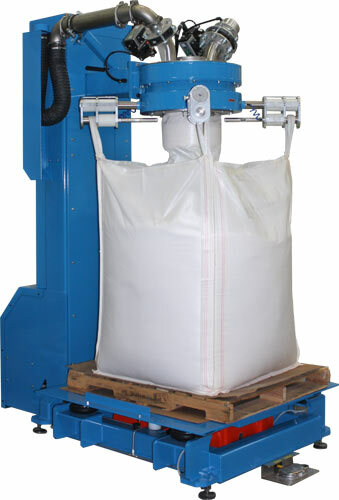 Power-Lift™ system positions fill head for ergonomic bag connection by operator while standing at floor level. Inflatable USDA/FDA approved spout seal creates a dust-tight connection to the bag fill spout; feature is actuated by ergonomic foot pedal for inflation and deflation. Gain-in-weight scale system with NTEP approved weigh modules. System includes a remote Allen-Bradley MicroLogix PLC with Allen-Bradley PanelView 1000 Plus color touch screen operator interface. Unit also includes a drum fill adaptor which attaches directly to fill head (not pictured).